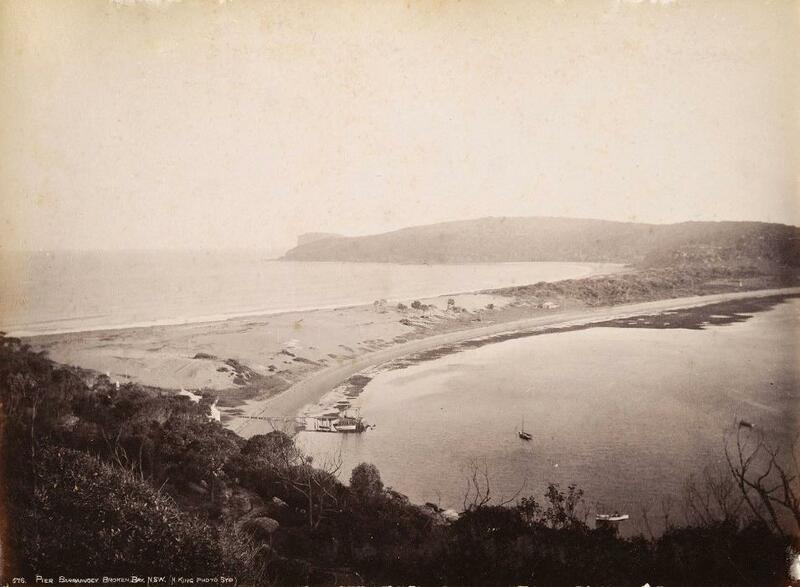 As early as 1855 a basket was reported to be raised to shine a light for all those who travelled around the sometimes treacherous headland of Barrenjoey. This device came from a wooden hut erected as early as 1843 on the headland when the Broken Bay Customs Station was opened. From here ships were monitored as they entered or left the port of Pittwater. Through the constant lobbying of Robert Stewart the member for East Sydney who had lost his father, William Stewart a master mariner, to the sea in 1820, two wooden structures were erected on the headland. Named the Stewart Towers after this gentleman they were approximately 4 metres and 6 metres in height, made of wood, and painted white. On and after Monday, the 20th July, two temporary fixed lights will be exhibited on Barrenjuey, the inner south headland of Broken Bay. The lights will be situated E.S.E and W.N.W from each other, at a distance of 180 feet apart, the higher one being 347, and the lower one 315, feet above high-water mark, and they will be visible at a distance to seaward of about 8 miles. LIGHTS ON BARRENJUEY, BROKEN BAY. Two lights were exhibited on Barrenjuey, which forms the south head of the entrance into Broken Bay, for the first time, last night. It will, perhaps, be in the recollection of the readers that the sites of these new lights were fixed on the 8th of last mouth, when a party of gentlemen, consisting of the Governor, the Superintendent of Pilots, Captain Hixson, the Colonial Architect, Mr. Barrett, the Engineer-in-Chief for Harbours and Rivers, Mr. Moriaity, Mr. Coles, of the Colonial Architect's Department, Mr. Stewart, M.L.A., Mr. Trunks, M.L.A., and several other gentlemen, went down to Broken Bay in the Government schooner Thetis. The site of both the lights having been fixed, the work of erecting the temporary towers was commenced almost immediately, under the superintendence of Mr. Hudson, of the Colonial Architect's department and they were finished about a week ago. The towers are temporary structures, the inner one being twenty feet above the rock, and the outer one ten feet.. Each tower is constructed of four hardwood posts, firmly fixed in the rock, which has been excavated to receive them, and they are protected from the weather by sheets of corrugated iron. The lanterns are fixed up on the wooden structure, and about four feet below the lights running round each tower, is a platform from which the trimmer can light and clean the lamps. A sleeping berth for the light-keeper has been fitted up in the larger tower, which is placed at a distance of 1180 feet in a W.N.W". direction from the outer tower. The outer light is 315 feet and the inner one 347 feet above high water mark. Each tower is furnished with three lanterns lighted with kerosene, to form a fixed bright light, and will be visible at a distance of about twelve miles to seaward. From a notification to mariners in the Government Gazette, we learn that both lights will be eclipsed between the bearings of South mid S.S. E ½ E., to prevent them from being seen over the land which recedes from the Outer South Head, and also to ensure a vessel to pass a safe distance off the South Head, when running with the lights in sight for the purpose of obtaining anchorage in Broken Bay. 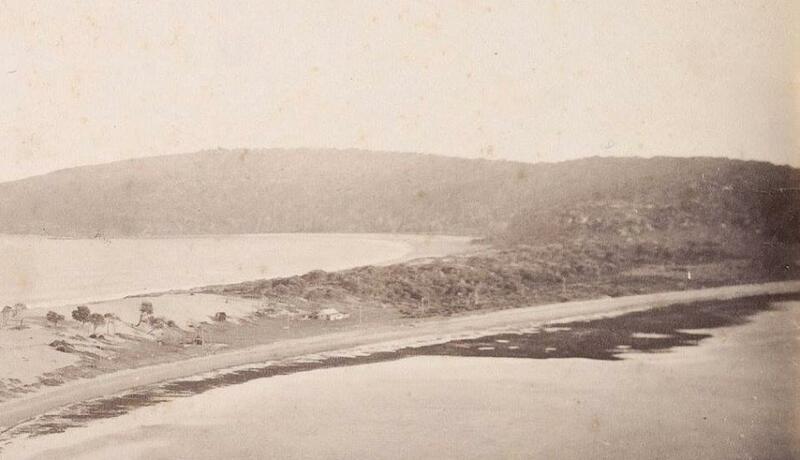 The Stewart family lived on promised land grant of 200 acres at Broken Bay on the Hawkesbury River and left in 1831 before it had been surveyed. Robert went to Sydney c.1830 and was apprenticed as a cabinet maker and owner of a cedar yard. 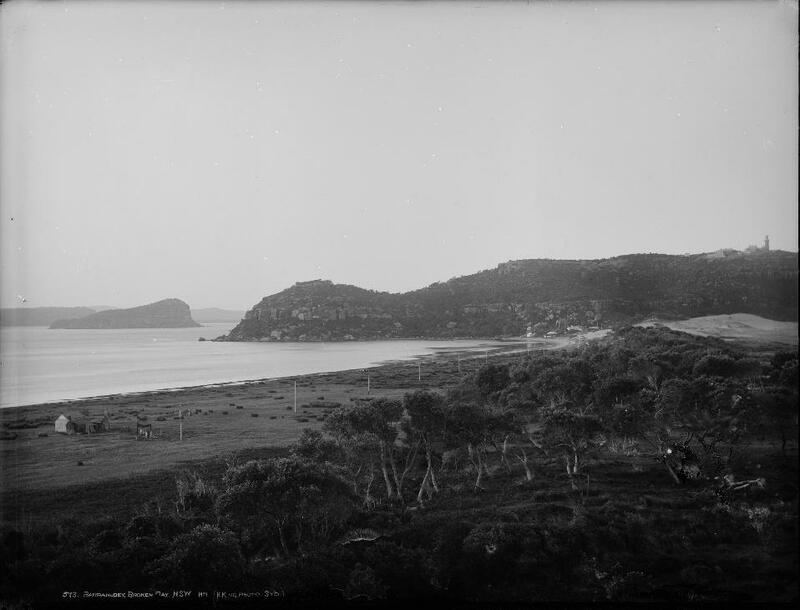 He eventually established a family claim to a grant at Broken Bay in 1860s. BARRANJUIE LIGHTHOUSE. TO THE EDITOR OF THE HERALD. Sir,-I was rather surprised to find in trio Herald of Saturday, a communication wherein " George Muhall, jun," contradicts the sworn evidence of myself, J. Walker, and G. Williams, given at the inquest held on the body of the late Henry Tucker, to the effect that up till quite dark on the night in question we were not within two miles of the land, so that if the lights had been there, we must have seen them. Subsequent shipping disasters and the increasing frequency of trade via vessels up and down the coast increased the need for a stronger light that were not subject to prevailing storms, the times such beacons are most needed. The ceremony of laying the cornerstone of the new |lighthouse at Barrenjoey was performed on Thursday, by Miss Rosa Barnet, daughter of the Colonial Architect, and everything connected therewith passed off in a highly satisfactory manner. The contractor issued invitations to several ladies and gentlemen to be present, and among those who responded thereto were Messrs. J. S. Farnell, E. Greville, and J. Hurley, M.L.A., Captain Hixson, and Messrs. Thompson, Whiting, Jeannerett, Wilson, Walker, Barnet and Spencer. Mrs. and Miss Barnet and several other ladies were also present. The party loft the Circular Quay at a quarter past 7 o'clock, in the steamer Emu, for Manly Beach, whence they were to go overland in vehicles. The morning was somewhat cloudy, and the harbour overspread with a fog. Before the steamer reached Manly, however, the fog had entirely disappeared, and the sun made an effort to beam forth through the somewhat sombre sky. Arrived at Manly, three coaches were found in waiting, which were quickly filled, and a start was then made for host Cohen's hotel, on reaching which it was announced that breakfast was awaiting us. The early hour at which most of the party had been compelled to shake off dull sleep, in order to be in time for the boat and the trip down the harbour, had rendered it quite unnecessary that the announcement should be repeated. Accordingly, we immediately wended our way upstairs to the dining-room, where a really excellent breakfast had been provided. Good humour reigned supreme. After breakfast we again took our seats in the vehicles-the ladies in one and the sterner portion of humanity in two others, and made a start on our journey proper, the vehicle containing the ladies going on first. The road for some distance, after leaving Sydney's favourite marine suburb, was dull and uninteresting ; but as we went on the features of the landscape changed, and the level tracts covered with stunted timber and brushwood gave place to undulating country, with trees of large dimensions, though evidently not of much commercial value. One conspicuous features was the number and great variety of ferns, which, after the shower of rain, looked beautiful. I almost forgot to say that just after leaving Manly rain began to fall, but it was not heavy and only lasted a short time, so that mackintoshes and umbrellas were speedily dispensed with. The sun then came out in full force, and the remainder of the day, with the exception of one very slight shower, was beautifully fine. Until Narrabeen Lagoon was reached, the journey was not productive of anything worthy of record beyond the fact that every one seemed to be m the best of spirits. The passage of the lagoon was, however, rather exciting to most of the party, from the fact that hints had been thrown out beforehand that the horses might jib, and leave us in the middle of the water before it was accomplished ; that the water was deep, and the swerving of the horses to either side might be the means of increasing the applications for space at Haslem's Creek. Notwithstanding our "critical position" the utmost coolness was observed; whilst we were crossing the ladies were assured by one gentleman in our vehicle of their perfect safety by the fact of so many " life-boys " bring close to them. A merry peal of laughter was the only reply. Frequent inquiries were made of the ladies as to whether "their feet were wet yet," as the bottom of the body of their vehicle seemed to be immersed; and it was evident that if such a calamity had happened several of our party were prepared to go to any extreme to avert its repetition. However they were not called upon to exercise their undoubted courage, or manifest other than in the way mentioned, their chivalric devotion. We got through the lagoon in safety. The remainder of the road-or rather track was in fair order, and we made respectable progress. As we neared the end of our journey we gradually ascended a hill, on reaching the top of which a magnificent panoramic view burst upon us. At our feet lay the waters of Broken Bay, or rather that portion of it termed Pitt Water. For miles it stretched towards the entrance to the mouth of the Hawkesbury ; while, on either side, bold headlands, crowned to their summits with timber, and looking like great sentinels, rose from the water's edge. Expressions of wonder at the beauty of the scene were heard on all sides, and the fact that this lovely place is so little known to denizens of the metropolis was freely commented on. But our steamer, the good ship Florrie, owned by Mr. Jeannerett, was in waiting, lying alongside a jetty at the head of the bay, so we immediately embarked for our destination, Barrenjoey, a distance of about eight miles. On the opposite side of the bay is New Port, the property of Messrs. Mills and Pile and Mr. Jeannerett, who are erecting an hotel, for the accommodation of visitors to the bay. It will have a fine situation ; and when the place becomes more widely known, as it deserves to be, the hotel will doubtless be largely availed of. The trip down the bay was greatly enjoyed ; and every point of interest critically scanned. Shortly before 1 o'clock, or about on hour after leaving the wharf, we steamed opposite the jetty, at the Customs-house landing, a short distance away-the depth of water not permitting us to go alongside, and soon Mr. Black, with his whaleboat, came along-side. The whole of the party were then transferred to her, and safely taken on shore, while the provisions, ice., were conveyed in another boat. After a short stay at Mr. Black's house, we prepared to make the assent of the frowning rock upon which the lighthouse is to be erected. As it is over 300 feet high with sides almost perpendicular, the task was looked forward to with a degree of interest which all under-takings of a similar nature excite in the persons principally concerned. Fortunately for the ladies, Mr. Banks, the contractor, had a " tram-car," or rather trolly, in waiting, upon which they were to be taken to the top. It may be said here that this tramway, the rails of which are of hardwood, is a remarkable evidence of the ingenuity Mr. Banks has exhibited in overcoming the many difficulties in-separable from an undertaking of such magnitude as that of the erection of the Barrenjoey lighthouse. For sometime otter the erection of the lighthouse was decided upon it was contended that it would not be possible to have a road constructed by which the necessary materials could be conveyed from the base of the rock: to the site of the lighthouse, and that they would have to be hauled up os-or the face of the rock ; but Mr. Banks has completely upset this contention. The tramway is 1000 yards long, and is used for the conveyance of everything, except the stone, which is obtained on the top of the rock itself. It has been found invaluable for the purposes for which it was designed and constructed. It is drawn by two horses, which, it may be imagined, when it is stated that some of the gradients are 1 ni 12, have their work to do. The car or trolly is fitted with a brake, which is so powerful that the car can be stopped almost in its own length when going down the steepest incline. However, this is a digression. The ladies were taken up safely, though not without some misgivings on their part " that the thing would go back." It is questionable if there is along the whole-coast-line a finer view than that which is presented to the eye of the beholder from the top of this Barrenjoey. Away to the north is the north head of Broken Bay ; taking this as the beginning of a semi-circle, round towards the left Brisbane-water, the mouth of the Hawkesbury, and Pitt Water are seen in succession, with Mount Elliott (in the form of a lion couchant) guarding the entrance to the second named. Shortly after the whole of the party reached the top due preparations were made for the ceremony. The crane and other places were decorated with bunting, while the flagstaff was "staggering" almost with flags, amongst them being the figures denoting the motto " Advance Australia," so that ships in the offing-of which there were several would be enabled to read it. After all the preparations had been completed, and the bottle containing the papers, coins, &c, had been placed in the receptacle prepared for it. The mallet and trowel were then, handed to Miss Barnet, who, after the orthodox preliminaries, had been gone through, declared the stone to be well and truly laid.. On the call of Mr. Barnet, three hearty cheers were given for her Majesty the Queen, and three for his Excellency the Governor; and, on the call of Mr. Hurley, three cheers were given for Miss Barnet. The silver trowel and mallet were from the atelier of Messrs. Hardy, Brothers, and are very handsome articles. On the face of the trowel is the inscription, *' Presented to Miss Rosa Barnet upon the occasion of her laying the foundation-stone of the lighthouse at Barrenjoey, New South Wales, 15th April, 1880." The trowel is of solid silver, neatly chased, and the handle of ivory, the mallet being of tulip wood. Mr. Barnet thanked the company for the honour which they had done his daughter, which was certainly quite unexpected. He had intended to come down and see the stone laid, but did not expect any ceremony. He had, therefore, all the greater reason to thank them. (Applause.) After the ceremony had terminated, the party returned to the bottom of the rock, the ladies going as they came-on the tramway, and adjourned to Mr. Blade's house where luncheon was served up, and a most enjoyable affair it proved to be. 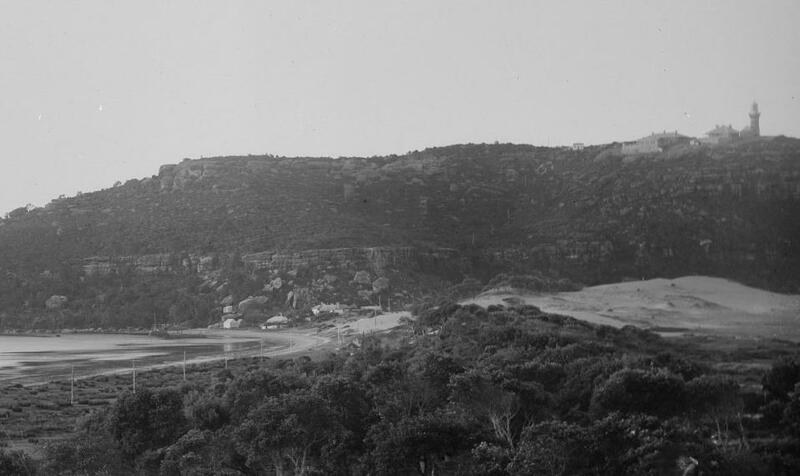 The necessity for a lighthouse at Barrenjoey was brought under the notice of the Government as far back as 1868, when the present site was selected as the best adapted for the purpose, but the land being private Property, with the probability of considerable delay before the Government would be enabled to take possession of it in order to meet immediate requirements, Captain Hixson, H.N., superintendent of harbours, lighthouses, and pilots, recommended the erection of two temporary wooden buildings, in which lights might be exhibited. This recommendation was approved of by the then Colonial Treasurer, the Hon. Geoffrey Bagar, the work being carried out by Messrs. Hudson, Brothers, of Sydney, at a cost of about £300, including- £35 for the two lanterns, &o'., made and supplied by Messrs. F. B. Robinson and Son, of George-street, Sydney, and completed in August, 1868. In the year 1873, at a conference of the principal officers of the Marine Departments of the Australian colonies, held in Sydney, at which Captain Hixson was unanimously elected chairman, the members of the Conference being:-New South Wales. Captain Hixson, President of the Marine Board; Queensland, Captain Heath, B.N., Chairman of the Marine Board, and Port Master; South Australia: Captain Ferguson, President of the Marine Board; Tasmania, Mr. C M. Maxwell (Warden of the Hobart Town Marine Board) ; Victoria, Captain Payne, R. N.(Chief Harbour-master and Chairman of Steam Navigation and Pilot Board); Western Australia, Captain Ferguson (President of State Marine Board of South Australia),-it was resolved to recommend the erection of a lighthouse at Barrenjoey, with light of the second order fixed red light, and in the year 1874 plans for a permanent light and quarters were prepared, and the sum of £6000 was also in that year voted towards the erection of the buildings. The matter, however, was postponed from time to time, and tenders were not invited until October, 1878, but those received being considered too high, they were declined. Ultimately, in October, 1879, the tender of Mr. Isaac Banks, amounting to £18,696, was accepted, and preparations were at once made for commencing the work. This tender, however, did not provide for the lantern and dioptric lenses which were obtained from Messrs. Chance, Brothers, of England, at a cost of £2210. 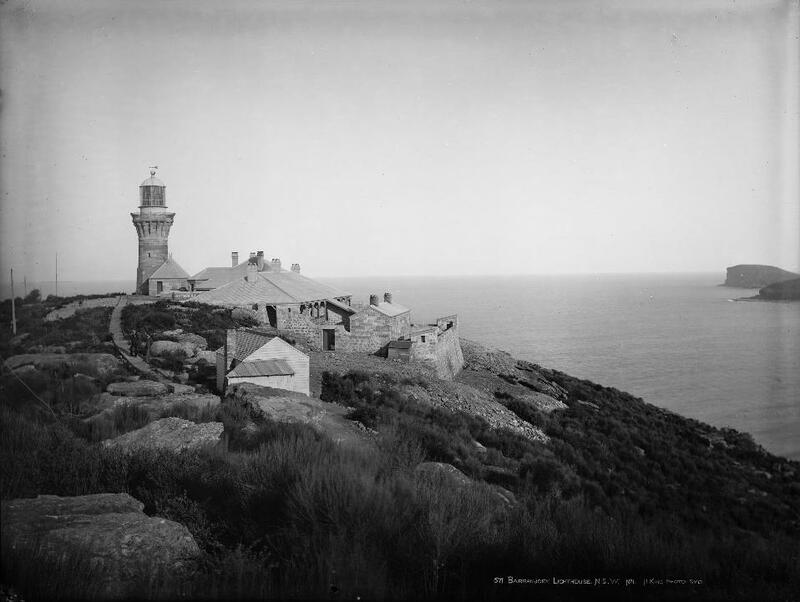 The light about to be placed upon this prominent headland is of the second order of fixed dioptric red lights, with capacious well-ventilated lantern, having all modern improvements, placed in a substantial iron light-room, the whole standing upon a strong tower, 38 feet high, built with the stone of the locality. The height of the light will be 371 feet over high-water mark, and it will be visible at about eighteen miles distance. The tower will be fitted with an iron spiral stair, communicating with the upper floor. Adjoining the tower will be an oil room, with passage and exterior stairway communicating with the principal quarters. The underkeeper's quarters will be placed slightly lower on the hill to the south-west. The tower and buildings will be replete with every convenience for; the efficient working of the light. The new light will supplant the present "Stewart" lights, which have been in use for the last thirteen years. This work has been designed by the Colonial Architect of Now South Wales-Mr. James Barnet-and is being carried out under the superintendence of Mr. E. S. V. Spencer, clerk of works, and Mr. John Kelly, foreman of works; the contractor, as before stated, being Mr. Isaac Banks. The bottle which was placed under the stone contained a paper with the names of the Government and of the vice-regal staff; list of members of both Houses of Parliament; report of proceedings of the Marine Board Conference on lighthouses; report of the laying of the foundation-stone of Macquarie Lighthouse; Moore's Almonas ; a copy each of the Sydney Morning Herald, Sydney Mail, Echo, Evening News, Town and Country journal, Sydney Punch, Daily Telegraph, and the Illustrated Sydney News; report of the Shipwreck Relief Society, and a medallion of Queen Victoria, besides several current coins of the realm. It maybe added the site selected by the Marine Board has been so closely adhered to that the "broad-arrow " out in the solid rock, by which it was marked, appears directly in the centre of the foundations. The arrangements for carrying on the works seem to meet all the requirements. 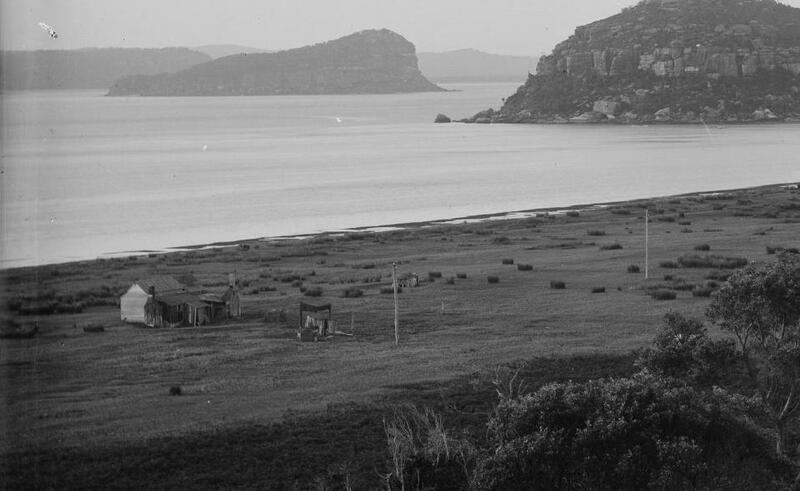 Houses for the accommodation of the workmen have been erected on the seaward side of the isthmus which joins Barrenjoey to the mainland, and the men seem comfortable and contented. Two men lost their lives in the building of the Barrenjoey Lighthouse and lighthouse keepers cottages. One was William Stark who died in an onsite accident when the jib of a crane fell on him. The second, George Cobb, drowned in a boating accident. 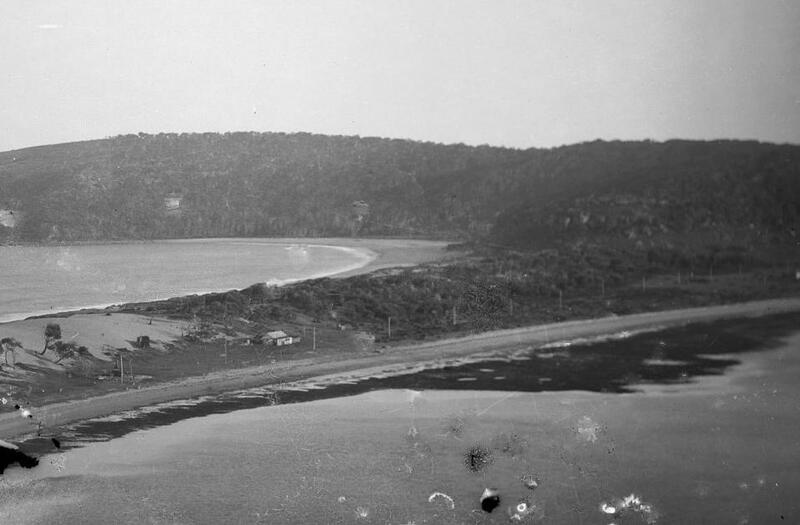 Both were buried at the original St John's The Baptist Church on the hillside overlooking Bongin Bongin Beach (now Mona Vale Beach), within the 280-hectare Bassett-Darley Pittwater Estate. Their headstones were made by their fellow workers. Mr. John Kelly was Foreman of Works thereafter, and guided by Mr. E. S. W. Spencer, the then Clerk of Works. The stone used for the lighthouse, lighthouse keepers and assistant lighthouse keepers cottages was quarried from the headland itself, just below the site of the current assistant lighthouse-keeper cottages. The other materials required were brought by ship to the Customs Station Wharf and carried via the trolley devised by Mr Banks to the constructions site. The original estimate did not include the lights needed and by completion twenty thousand pounds had been spent. Build time was fourteen months, completion on July 20th, 1881. Of lighthouses the Colonial Architect has the completion of four under his direction. The principal one is that known as the Macquarie lighthouse, near South Head. Several months ago this reached its full height so far as the tower is concerned, but its completion has been delayed pending the arrival of the lantern from England, which has taken more time to prepare than was anticipated. This will be fitted with an electric light, which Mr. Douglas, of the Trinity Board, has written to state will be superior to any in the world. In order to make it as perfect as possible, Professor Tyndall, whose authority on light is unquestioned, was consulted. Mr. J. Elphinston is the contractor for the erection of the lighthouse, and the work is estimated to cost £11,300. Barrenjoey lighthouse will be ready for use early in August, the building being nearly completed. A second-class red dioptric light, produced from oil, will be introduced. Mr. Banks is the contractor, and the work of erection is estimated to cost £18, 695. The light shone for the first time on the 1st of August 1881. The New Lighthouse at Barrenjuey. The necessity for a lighthouse at Barrenjuey, the South Head of Broken Bay, was brought under the notice of the Government as far back as 1868, when the present site was selected as the best adapted for the purpose, the land being private property. Captain Hixson, R.N., President of the Marine Board, recommended the erection of two wooden buildings in which the lights might be exhibited. This recommendation was approved of by the then Colonial Treasurer, Mr. Geoffrey Edgar, the work being carried out by Messrs. Hudson Brothers of Sydney, under the superintendence of Mr. W. Coles, first clerk of works in the Colonial Architect's department, at a cost of about £300, including £85 for two lanterns, &c, completed in August, 1868. They were named the Stewart Lights, after Mr. Robert Stewart, the then member of Parliament for East Sydney, by whose efforts these lights were established, and they have been in use for the last thirteen years. In the year 1873, at a conference of the principal officers of the marine departments of the Australian colonies, held at Sydney, comprising Captain Hixson(chairman), representing this colony, Captain Heath, R.N., for Queensland, Captain Ferguson for South Australia and Western Australia, Captain Payne, for Victoria, and Mr. C. W. Maxwell, for Tasmania, it was resolved to recommend the erection of one lighthouse at Barrenjuey, to take the place of the two temporary lights, with lights of the second order of fixed dioptric red lights ; and in the year 1874 plans for a permanent lighthouse and quarters were prepared, and the sum of £5000 was also in that year voted towards the erection of the buildings. The matter, however, was postponed from time to time, and tenders were not accepted until October,1878. Those received being considered too high, they were declined. Ultimately in October, 1879, the tender of Mr. Isaac Banks, amounting to £13,695, was accepted, and preparations were at once made for commencing the work. This tender, however, did not provide for the lantern light, and the light rooms, &c. The lantern was obtained from Messrs. Chance Brothers, of England, at a cost of £2210. The entire work was completed by the contractor on the 20th instant. The lantern is capacious and well ventilated, having modern improvements, placed on a substantial iron light-room, the whole standing upon a strong tower, built with the excellent freestone of the locality. The height of the light is 371 feet over high-water mark, and is visible about 15 miles distant. The tower is fitted with an iron spiral stair, communicating with the upper floor. Adjoining the tower is an oil-room, with passage, and exterior stairway communicating with the principal quarters. The under-keepers' quarters' are placed slightly lower on the hill, to the south-west, and sheltered by the north-eastern cliff. The tower and the buildings are replete with every convenience for the efficient working of the light. 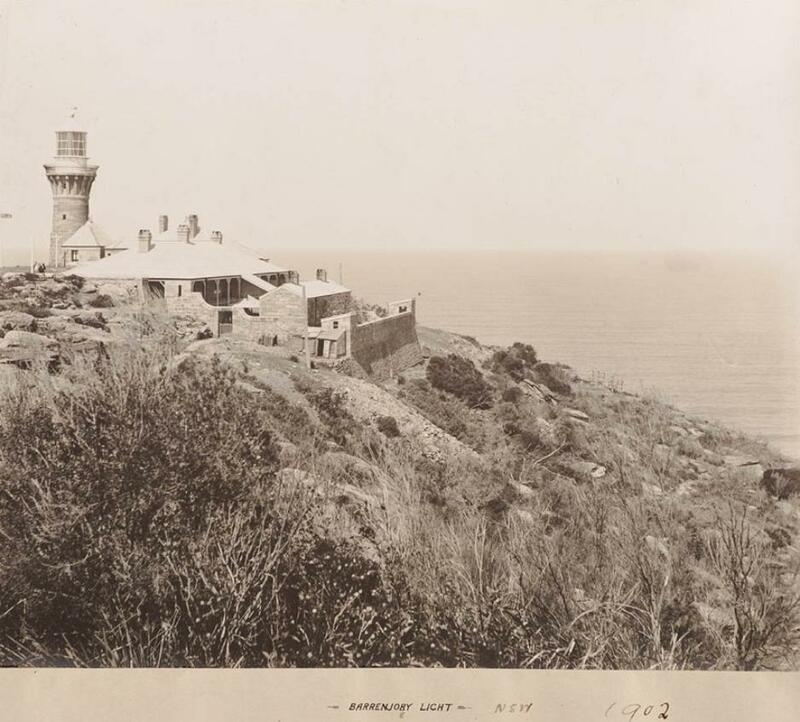 Searcy albums : Lighthouses in New South Wales, 1902, by Alfred Searcy, Barrenjoey Light, N.S.W., 1902 Digital Order No. a154002, courtesy State Library of NSW. Barrenjoey Lighthouse - The Construction threads collected by A J Guesdon, 2013.